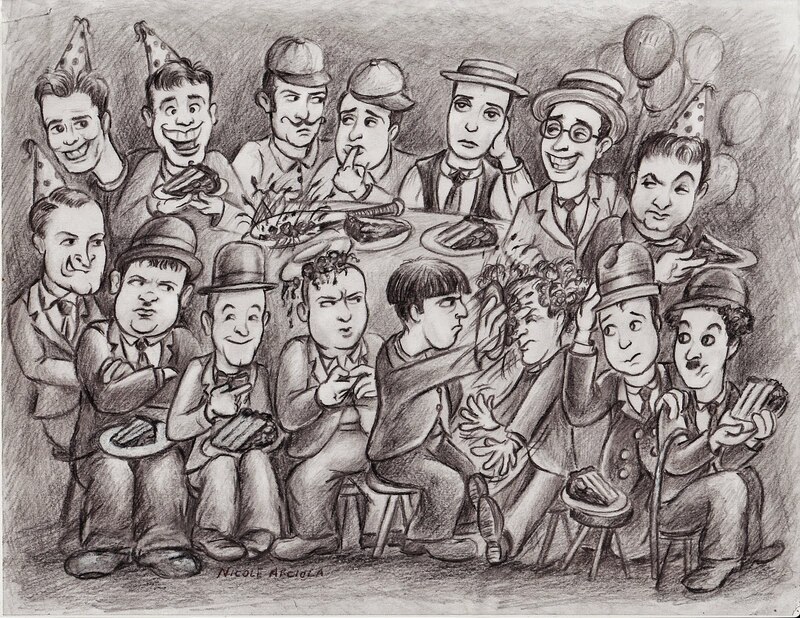 I offer today's blog post as a tribute to André Deed, who is the first comedian spotlighted in my book Eighteen Comedians of Silent Film. 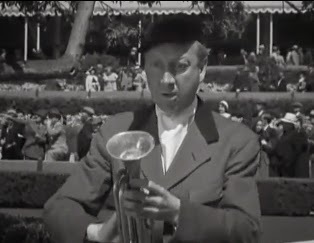 I continue to be fascinated by Deed, who may be the most unjustly overlooked performer in the history of film comedy. 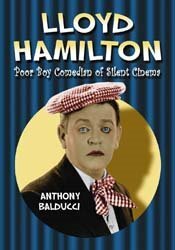 Just the fact that he was the industry's first comedy star should grant him prominent status in film history. But few people are aware of Deed or are willing to acknowledge his significance. 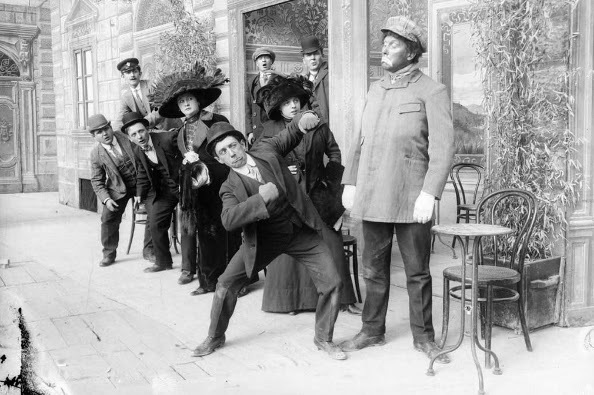 Not long after Deed made his film debut, a decidedly different comedian established himself as Deed's most formidable rival. 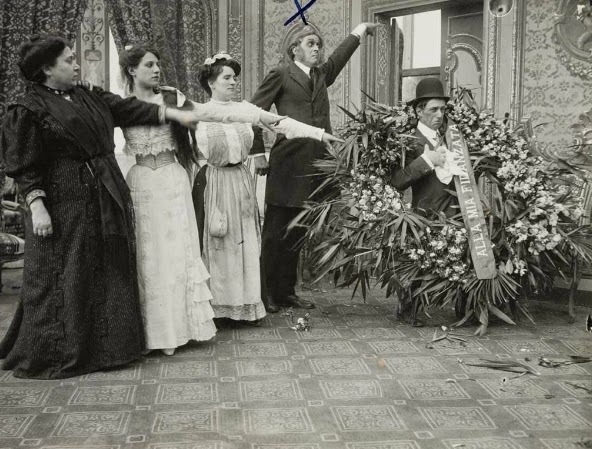 That comedian was the irrepressible Max Linder. 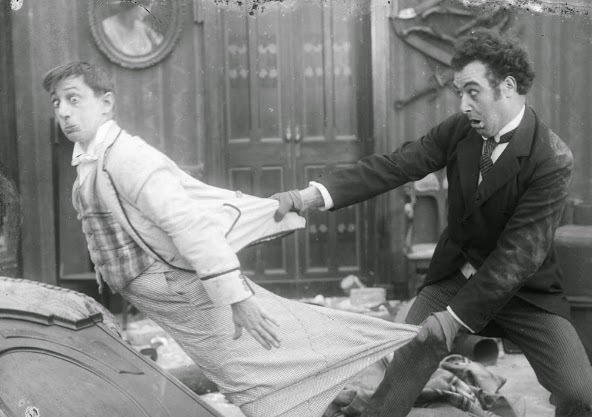 Deed and Linder were the yin and yang of early film comedy. But, at first, Linder did not seem as influential as Deed, who spawned far more imitators than Linder. There was, however, a good reason for that. Linder derived comedy from his distinct charm and personality. How could anyone really be Max Linder except for Max Linder himself? Deed played a bungling idiot who created destruction wherever he went. That was an easier formula to replicate. 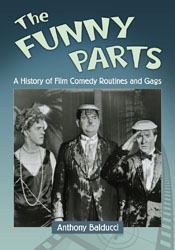 The first two American comedy stars were modeled after Deed and Linder. Essanay designed Ben Turpin to be the American Deed. 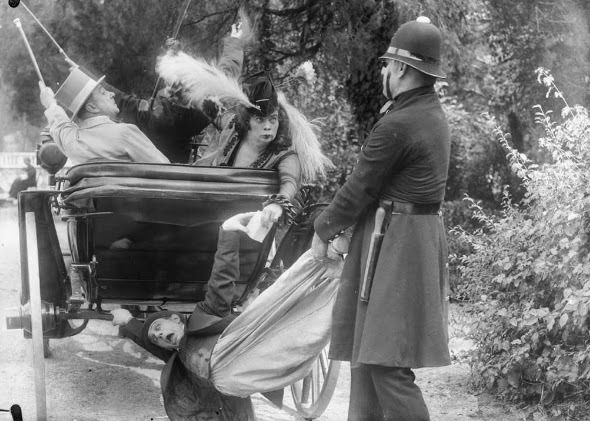 Turpin performed Deed's sort of foolish antics in several films, including The Crazy Barber (1909) and The Energetic Street Cleaner (1909). Biograph designed John Cumpson to be the American Max Linder. 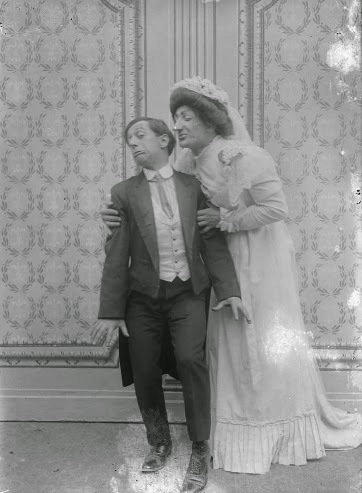 The first official film in Cumpson's "Mr. Jones" series, Mr. Jones at the Ball (1909), was a remake of Linder's Mon pantalon est décousu (1908). 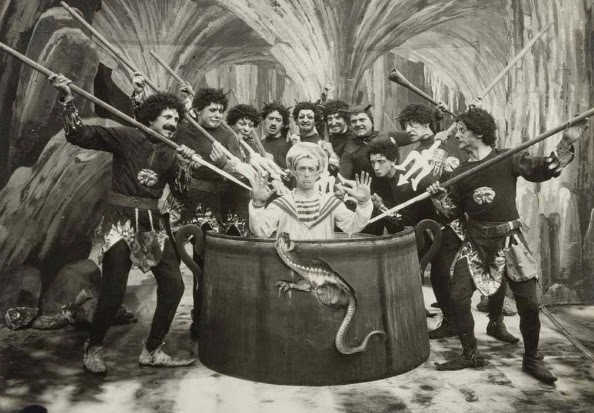 Deed, a protégé of Georges Méliès, is the missing link between Méliès and Mack Sennett. 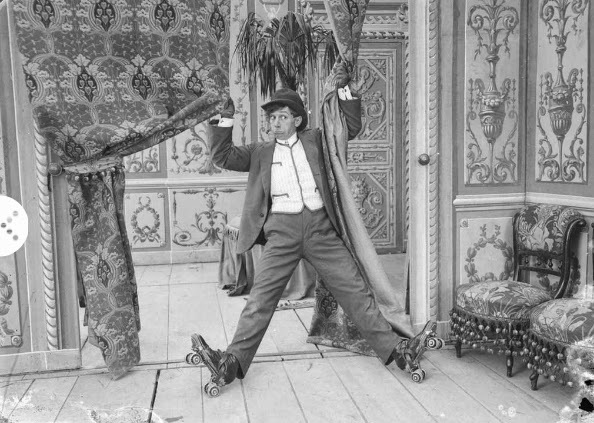 He achieved popularity with camera-trick gags and slapstick chases. 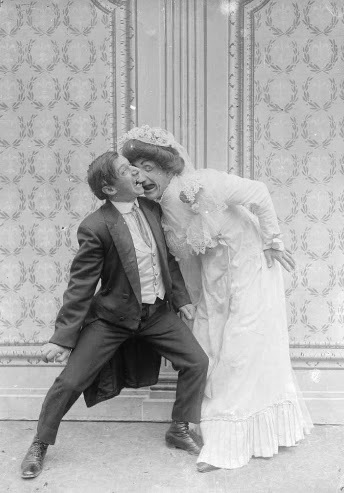 An early success for Deed was The Wig Chase (1906), which was written by André Heuzé. This film, which was about a woman's wig floating away with balloons and a mob of people climbing up the Eiffel Tower to retrieve it, established an effective formula of fantastic comic anarchy for the comedian. 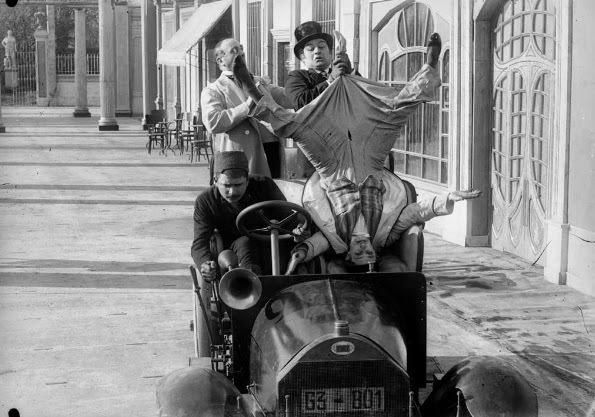 Heuzé later applied the same formula to The Runaway Horse (1908), a highly successful comedy that was quickly remade by Biograph as The Curtain Pole (1909). The Biograph film starred Mack Sennett as Monsieur Dupont, who was made up to resemble a grotesque version of the dapper Linder. 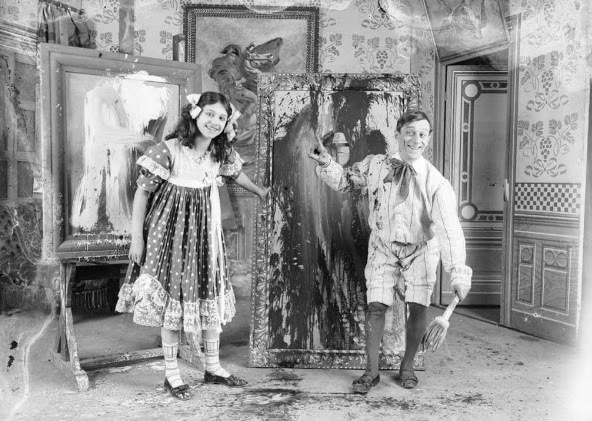 This funny and energetic film set Sennett on a path that would eventually lead the young filmmaker to launch the Keystone studio. Let's look at a few stills from Deed's films. 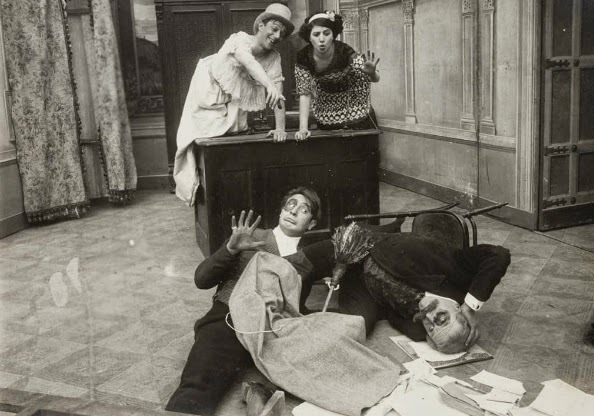 This is a still from the 1910 comedy Foolshead, Victim of His Honesty (originally released in Italy under the title Cretinetti vittima della sua onesta). In the film, Deed finds a handbag on the street and attempts to turn it in as lost property at a police station. 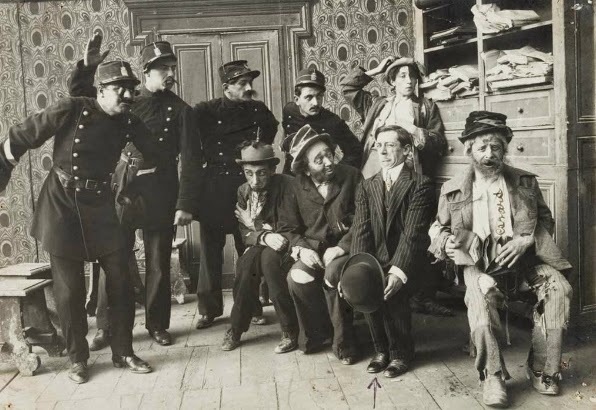 Unfortunately, the police have little interest in the handbag and compel Deed to wait among a menacing rogue's gallery. 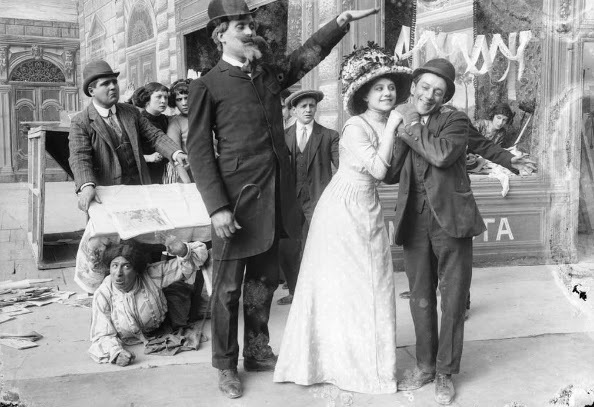 This is a still from the 1911 comedy Foolshead, Lady of Company (released originally in Italy under the title Cretinetti dama di compagnia). The plot was not the comedian's most original. A wealthy man will not allow Deed into his home to spend time with his daughter, which drives the young woman into a state of melancholy. The father is determined to cure his dispirited daughter of her loneliness. 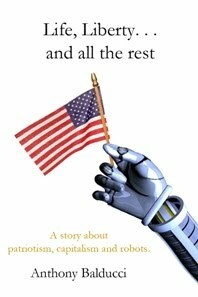 He dispatches a note to an employment agency to provide his daughter with a lady companion. However, the daughter intercepts the note and notifies Deed that they can be reunited if he comes to her home disguised as the skirted companion. Here are further stills from this period. 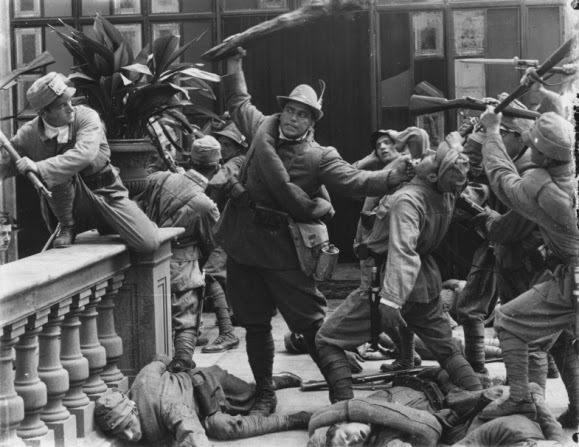 By 1914, Deed's films were no longer being exhibited in the United States. 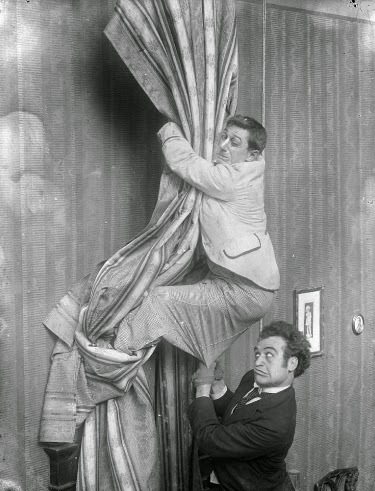 The success of the Keystone comedies prompted Hollywood studios to accelerate the production of comedy films and American exhibitors were more than content to occupy their programs with this new homegrown product. At this time, Deed made an effort to grow up on screen. He went from playing an aimless, childish idiot to playing an uptight, obsessive bourgeois gentleman. 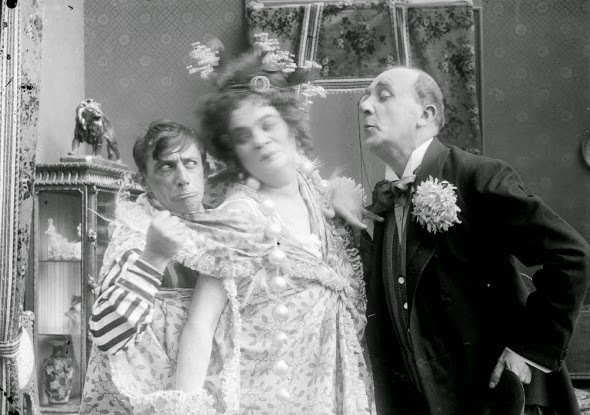 This type of character is on display in the 1914 comedy Boireau enragé fumeur. Deed feels compelled to smoke cigars incessantly, but his fiancé insists that he refrain from smoking during a visit to her parents' home. Deed, no matter how hard he tries, cannot resist smoking. He puffs furiously on a cigar whenever no one is looking and, every time that he is suddenly confronted by his fiancé or her parents, he acts quickly to find someplace to hide the cigar. At one point, he hides a cigar under his hat, which causes smoke to emit from the top of his head. He later drops a cigar down the boot of another guest, which burns the poor fellow's foot. 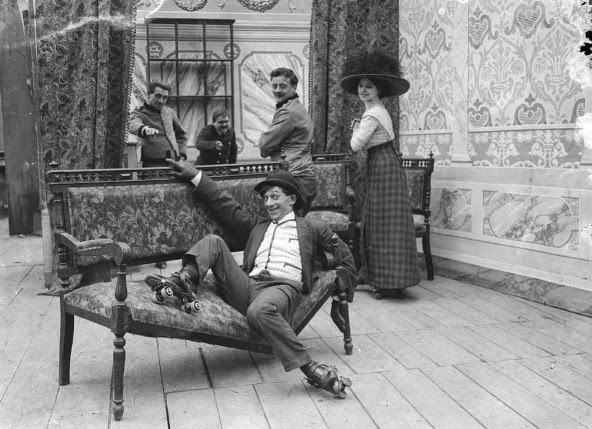 Obsessive behavior is also on display in Le Rocking-chair de Boireau (1914). Deed expects to relax in a rocking chair during a transatlantic voyage on a luxury cruise ship. Unfortunately, he finds himself repeatedly dislodged from the chair through a variety of mishaps and disagreements. Still, he cannot be dissuaded from enjoying a nap in the cozy rocker. At one point, he wrests the chair away from a woman and runs off with his prized possession rather than give it up. 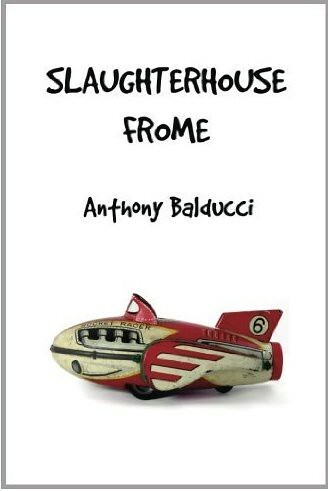 His dizzying race around the ship causes a great deal of disruption for other passengers. The quartermaster is furious when he finally captures Deed. Without a hint of mercy, he shuts the undesirable passenger and his chair into a barrel, which he proceeds to toss overboard. The film ends with Deed quietly napping in the chair on the sandy shores of a tropical island. The comedian's style in one-reel comedies had been frantic, but he managed to relax his style to a slight extent when he graduated to two-reel comedies. 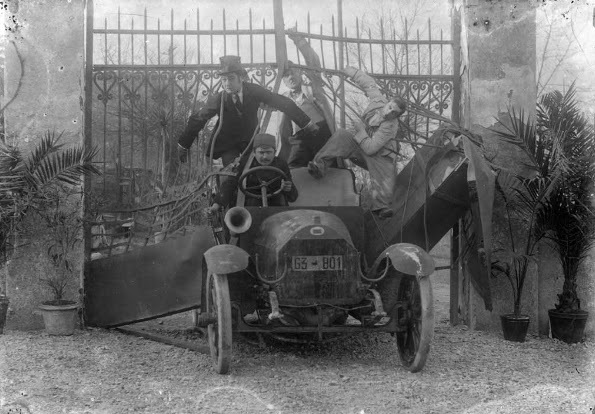 One of his two-reel comedies was the 1915 film Fear of Zeppelins (originally released in Italy under the title La paura degli aeromobili nemici). By this time, the German military was making extensive use of Zeppelins in bombing raids on the Allied Powers. Deed, who saw nothing wrong with transforming widespread panic into riotous humor, devised a plot based on the Zeppelin threat. 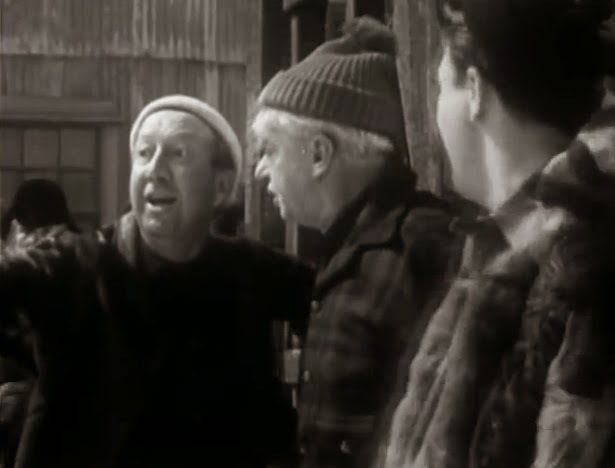 Deed starts out in the film as a joyful groom, but his joy turns to fear when he comes across a poster warning of a potential Zeppelin attack. While guests prepare for the wedding dinner, Deed gathers buckets of water to put out any fires that might be caused by the bombs. Not sure that he has collected enough water in the buckets, he fills a bathtub with water and pushes the bathtub into the middle of the dining room. 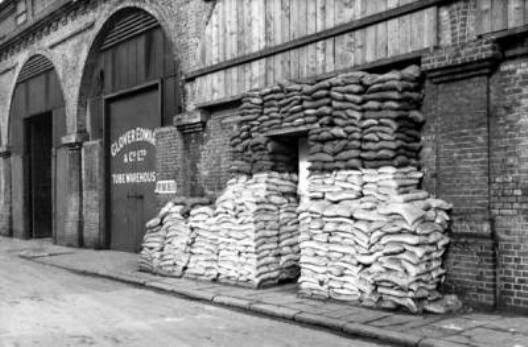 The dinner is interrupted by a horde of delivery men who, on Deed's instructions, have brought sandbags to fortify the building against a bomb blast. 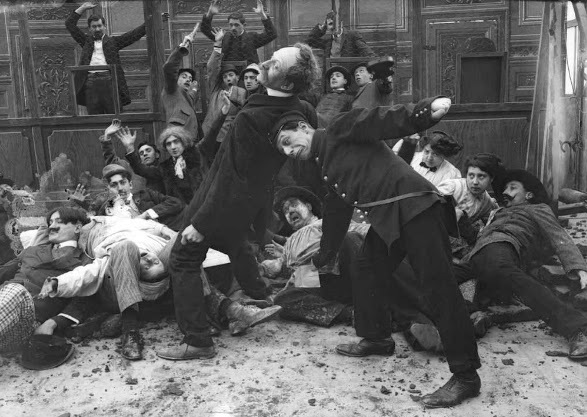 A member of the wedding party is upset by these disruptions and gets into a shoving match with Deed. A melee erupts as others become caught up in the battle. As people clobber each other with the sandbags, the sandbags split open and spill sand onto the banquet. Later, when Deed carries his bride over the threshold of the wedding suite, he must maneuver around an obstacle course of water-filled buckets and basins to get her to the bed. Before he has a chance to kiss his bride, he hears a cab driver honking his car horn, which he mistakes for an air raid alarm. He panics believing that the city is now, for sure, under attack by Zeppelins. He desperately persists to follow the instructions in a Zeppelin defense flier, but everything he does brings about further havoc for himself, his bride and his guests. 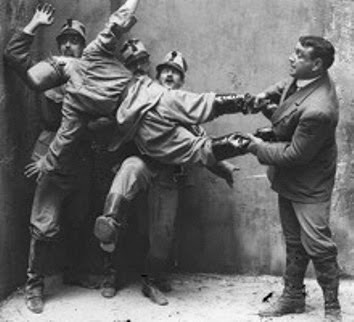 Deed's ability to refine his style was put to the test when, in 1916, he produced a 4-reel feature called Cretinetti and the Brazilian's riding boots (originally released in Italy under the title Cretinetti e gli stivali del Brasiliano). 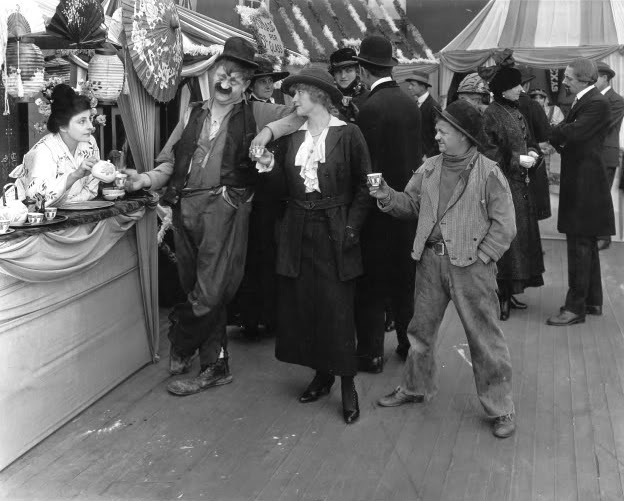 The film is lost today, but production stills suggest that the film was punctuated by the comedian's usual frantic action. The film provided Deed with a formidable adversary, Bartolomeo Pagano. Pagano was a muscular action star who, at the time, was appearing as a Hercules-like hero, Maciste, in an immensely popular sword-and-sandal series. It was, in a way, a circus routine - strongman versus clown. Other films had shown that no good could come from trifling with Pagano. Film historian Gino Moliterno reported in his book The A to Z of Italian Cinema that Cretinetti and the Brazilian's riding boots turned out to be "extremely popular" in Italy. Here are additional images from the film. Deed was overshadowed by the many comedians that followed him, but he was a funny and inventive filmmaker who inspired a number of popular comedians. His direct influence can be found in the work of Buster Keaton and Larry Semon. Any destructive bungler in films owes a debt to Deed. It is to give Deed appropriate recognition that I have persistently written about him in books and articles. 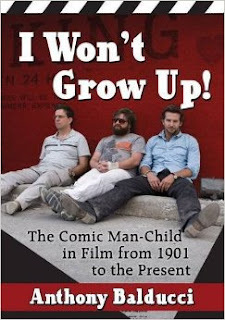 Deed will be a prominent subject in my forthcoming book on the history of the manchild comedian, I Won't Grow Up!. 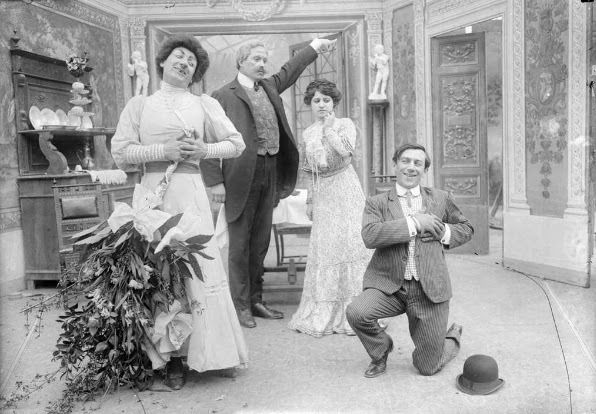 The photos featured in this article were taken from the digital online photo archive of the Museo Nazionale del Cinema. 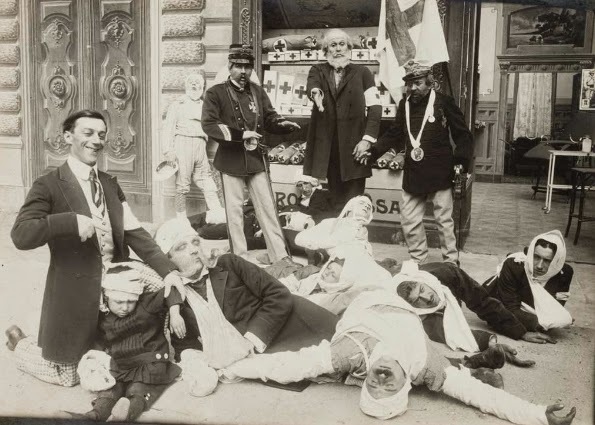 Also, I have added strangely intriguing photos from Una strana avventura di Cretinetti (1911) to a previous article, "The Surreal and the Satirical: Early European Comedy Cinema." Click here. 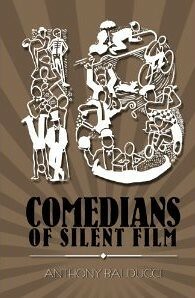 You can read more about Deed in Eighteen Comedians of Silent Film. Too often we find that lying behind a comedian's benignly silly grin is a deeply troubled and unhappy individual. 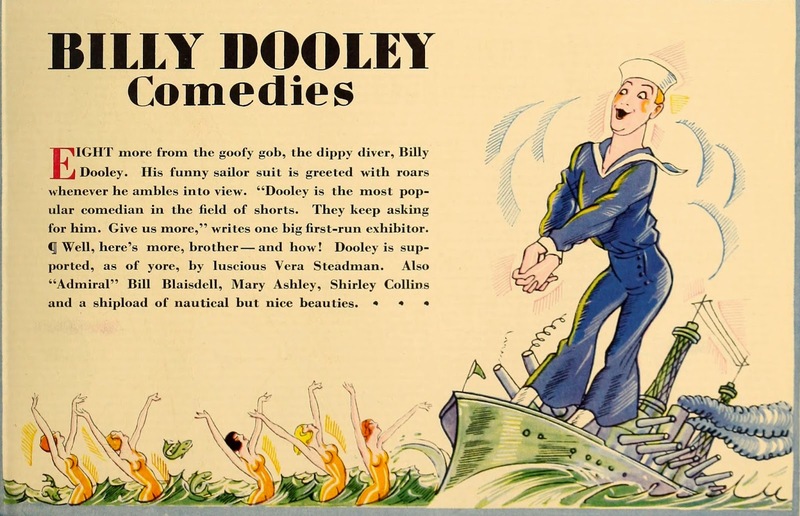 News accounts indicate that goofy, rubber-legged comedian Billy Dooley had problems with anger and anxiety. 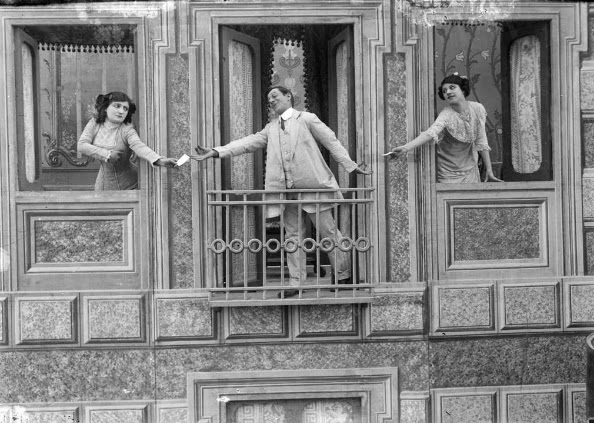 In 1922, Variety reported on a lawsuit filed against Cincinnati's Palace Theatre because Dooley became enraged by three teenage girls in the audience and had ushers eject them from the theatre. 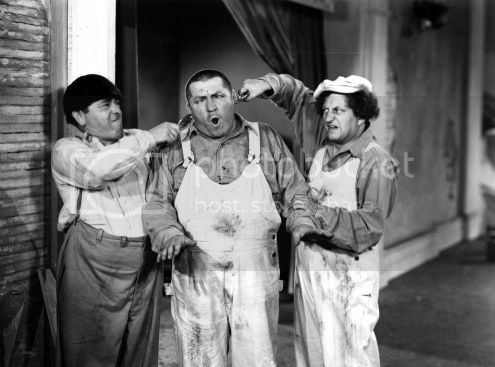 The reporter wrote, "Dooley said the girls were 'flappers' and insisted on laughing at the wrong times." 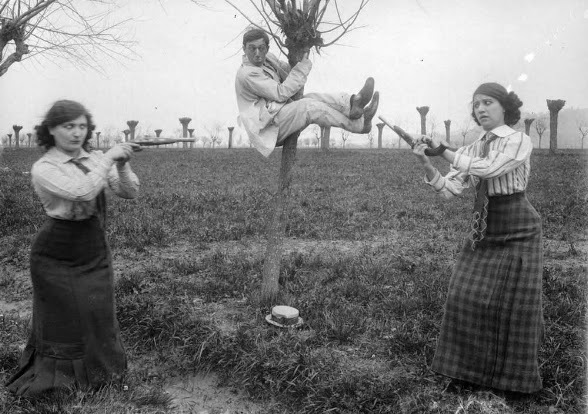 The young women claimed to have been humiliated by the experience. One of the young women, Margaret Plucker, said that she became distressed when an usher threatened to have her arrested. Reportedly, she fainted before they reached the exit and remained unconscious for a half hour. It was alleged in her lawsuit that she had been made exceedingly nervous by the incident, which had caused permanent damage to her reputation. Many theatre patrons stepped forward in support of the young women. The theatre immediately terminated Dooley's engagement. The young ladies may have exaggerated their trauma, but it is more than likely that Dooley overreacted. 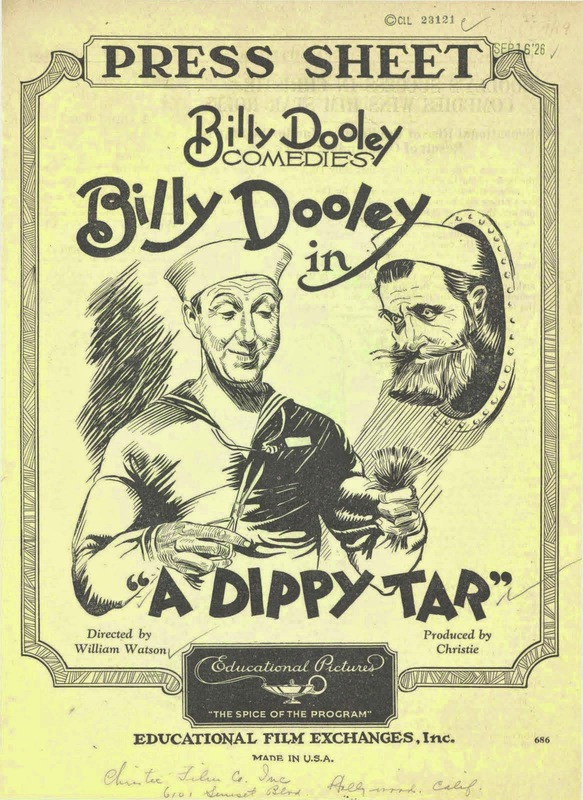 Stronger evidence of Dooley's emotional problems can be drawn from the fact that, in 1929, the comedian was admitted to the Sylvan Hospital in Hollywood to recover from a nervous breakdown. Dooley did not come back to work for a time. In 1931, he had a starring role in a two-reel comedy, Smart Work (1931), but this role represented his only film work for more than 3 years. He did not return before the cameras in full vigor until the end of 1932, when he appeared as a drunk swell in the tart office comedy Manhattan Tower. This began a new career for Dooley, who proved adept at playing character roles in feature films. He acted in 54 more feature films from 1933 to his death in 1938. Let's look at a few of his character roles. 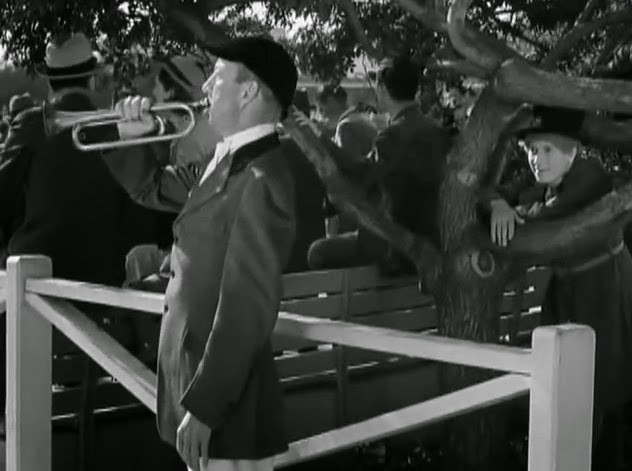 The comedian was prominently featured in a running gag included in the climax of Joe E. Brown's 6 Day Bike Rider (1934). 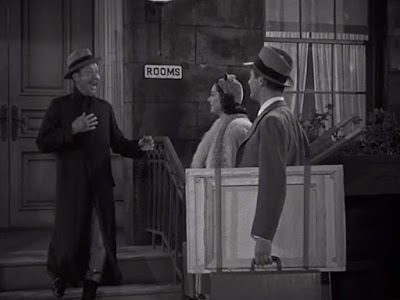 Dooley is the tall reporter in this scene from Harold Lloyd's The Cat's-Paw (1934). 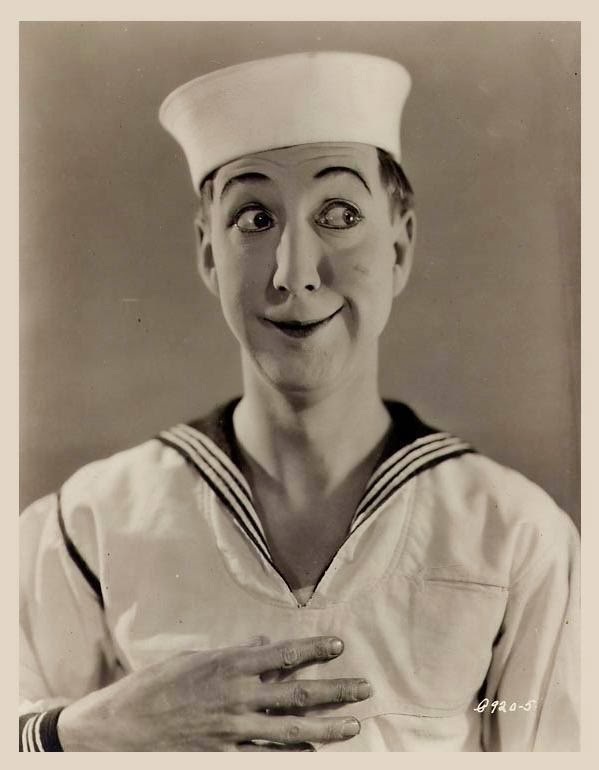 You can read more about Dooley in Eighteen Comedians Comedians of Silent Film. 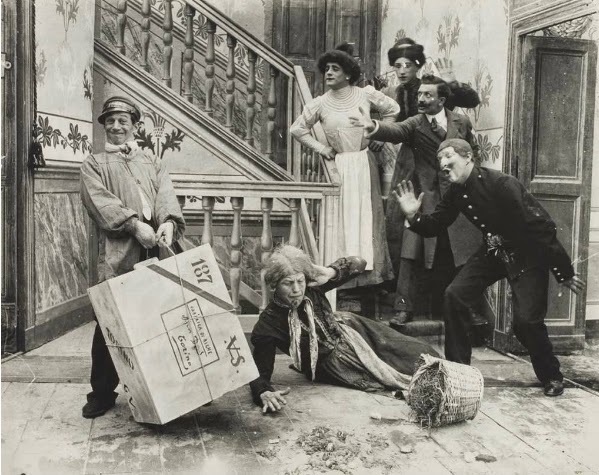 This month marks the 100th anniversary of Ham and Bud (Lloyd Hamilton and Bud Duncan), who began their partnership playing inept janitors in Lizzie the Life Saver (1914). 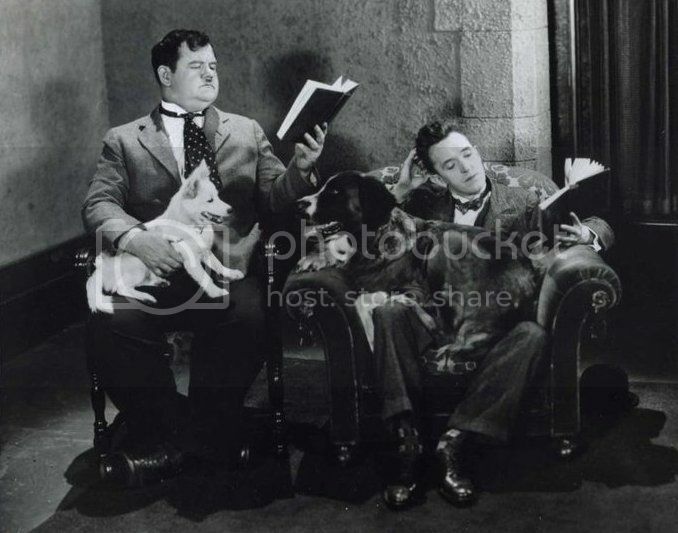 Ham and Bud had a relationship that was more distinctly developed than other comedy teams of the period. They were as close and dysfunctional as most brothers, which means that they could be fiercely jealous of one another in one moment and then be fiercely protective of one another in the next. So many comedy series of the period were random in their efforts to get laughs, but the Ham and Bud series was able to rely on its lead characters' well-defined relationship to stay on a reasonable and steady course during its prolific 3-year run.